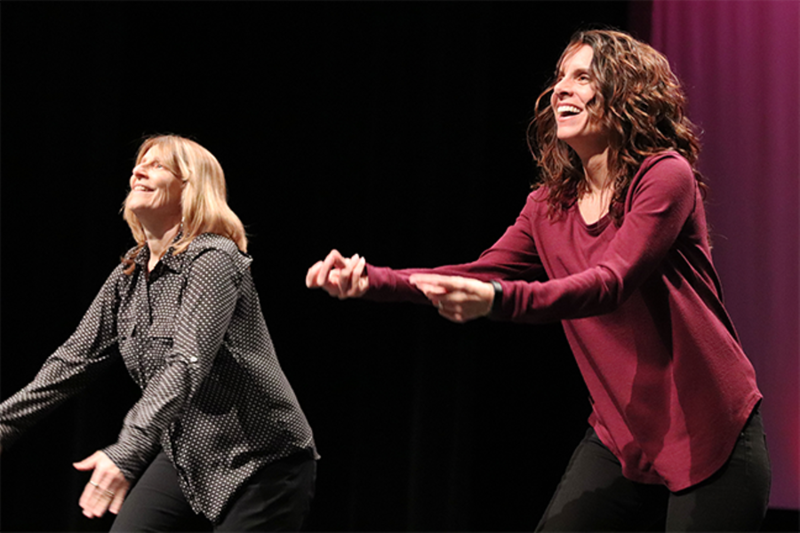 Courtesy Shari Brown, left, and Melissa Brown practicing for the Dancing with the Deaf Stars competition next week at the Arizona State Schools For The Deaf And The Blind. While driving to work in the morning, Melissa Brown practices dance choreography in her head. She's memorizing the moves for her upcoming performance in "Dancing with the Deaf Stars," a bi-annual dance competition hosted by the Arizona State Schools For The Deaf And The Blind. Melissa, who is deaf, performed in the last competition. She works in ASDB's high school as a JTED supervisor. She wasn't particularly comfortable with dancing in front of a crowd, but decided to give it a shot anyway. After having a great time, she jumped at the opportunity to participate again this year. Melissa's wife, Shari Brown, also works at the school as a counselor for blind students. She watched from the sidelines as Melissa prepared for the first competition and became intrigued. She decided she wanted to try it too and they soon became the competition's first female dancing pair. "We're kind of breaking tradition," Shari said. "We're having two women dance together." ASDB's deaf program serves about 350 students in preschool through 12th grade. The campus, just west of the interstate on West Speedway Boulevard, sits on 68 acres of manicured lawns and houses 43 students in dorms. Established in 1912, ASDB was the first school for deaf and blind children in Arizona, whereas the Phoenix Day School for the Deaf opened in 1967 and serves about 340 students. Jonas Camp, a deaf staff member, has worked at ASDB for the past 15 years. He spends most of his time with students who do not live in the Tucson area and stay in the dorms on campus. He danced in the last two competitions and won first place, then second place the following year. Now he's participating again, but this time as a judge. "I've been joking with other people here on campus that I'm actually going to take on the role of Simon [Cowell] from 'America's Got Talent,'" he said. "But really I'm going to look for those who you can tell are having fun and make sure that they are enjoying themselves. Maybe their costumes, how well they were able to coordinate with each other. I want to be able to see the effort that they put into these dances." "I think it is going to be fun experience for anybody in the community to come and see," Camp said. "A lot of the times hearing people may not entirely understand how deaf people are able to dance to the beat of the music, how they're able to hear those rhymes and rhythms. A dance competition like this would be a good way for them to come and see that it is possible." The competition, which is now in its fourth go-round, is really a fundraiser for the basketball program. Gerald Brown, the school's basketball and track coach since 2003, organized the event which is held at ASDB's Berger Performing Arts Center. He said it's been growing in success with each year they do it. The first one had a moderate turnout of about 70 people, but their audience increased over the years to more than 100 people at the last one. Gerald hopes they'll have a full house this year. "It's not just for fundraising purposes, it's also to bring the community in," he said. "We have not had much of a community, but this has been able to bring people in." "The first year we were unsure of what to expect, what was going to happen, and then we got more competitive as the years went on," he said. "This was a way to broadcast their skills because people are thinking they don't know what they can do or what their potential is so this is bringing it out in them." "This is also a good way to show the students that this is something they could look forward to, that they have that potential to dance, get up on stage and you never know, maybe we'll incorporate students at a younger age and have a youth dance competition," Gerald said. Melissa has her eyes on first place this year, while Shari says her goal is just to not embarrass herself. They've been practicing their routine for months, multiple times a week. "I can hear certain parts so you start learning when to do certain moves, where [Melissa] is dependent on memorizing it or kind of watching where I'm at—we help each other," Shari said. "I think it's a fun thing because people know it from the TV show, and it's kind of tweaking it to make it fun for the deaf community."